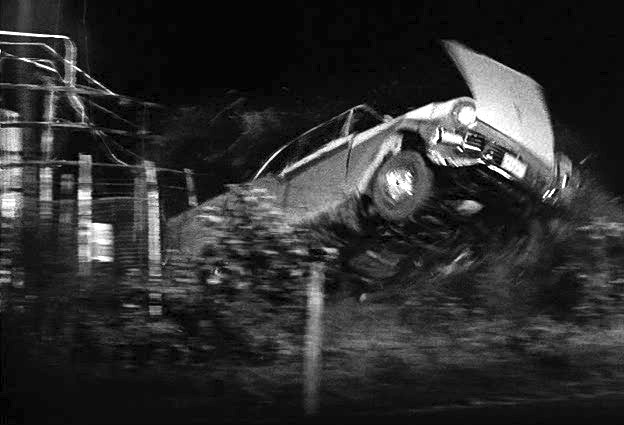 Blu-ray Review: Thunder Road (1958). 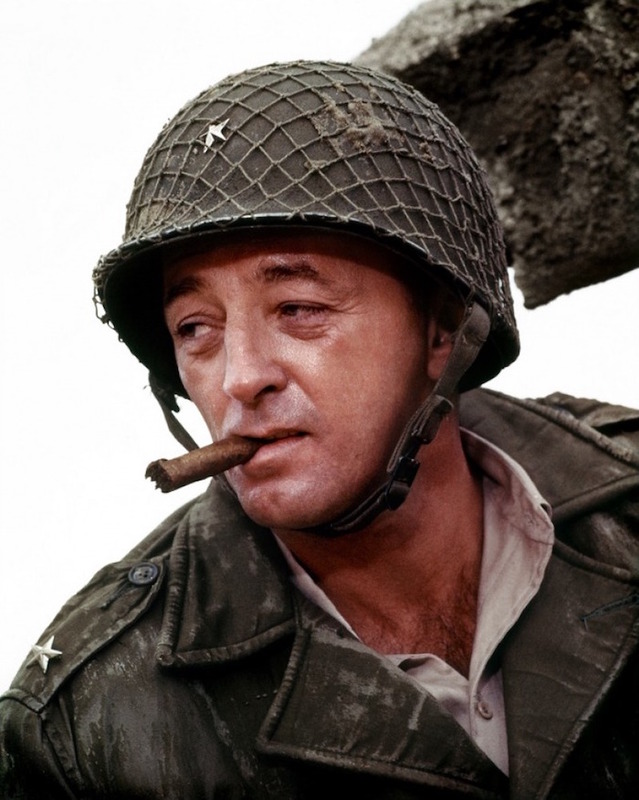 Robert Mitchum, who often claimed to have nothing but contempt for his chosen profession, didn’t seem like the type to almost singlehandedly write, produce and star in an independent film. But with Thunder Road (1958), that’s exactly what he did. He came up with the story, researched it (meeting with treasury agents and no doubt sampling some of the moonshiners’ product), worked on the script, selected the cast and director Arthur Ripley, scouted locations (settling on Asheville, North Carolina), even co-wrote the title song. The end result is a solid little picture that played drive-ins throughout the South for decades. 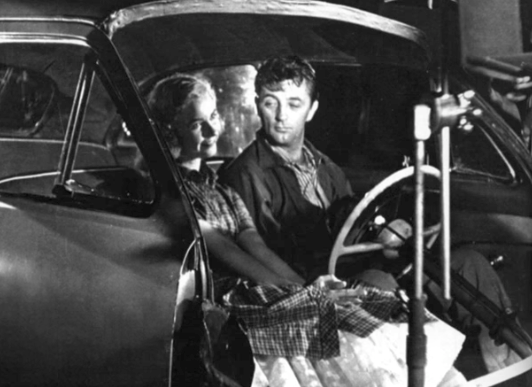 Mitchum is Lucas Doolin, a Korean War vet who hauls bootleg liquor in hopped-up Fords. Gene Barry is the T-Man determined to bring him in. Things are complicated by a large-scale mobster who wants to take control of the local shine market, a nightclub singer (Keely Smith) and local girl (Sandra Knight) vying for Lucas’ affection, and Lucas’ younger brother Robin (Jim Mitchum) who’s thinking about running some liquor himself. It might sound a little plot-heavy, but it’s not. 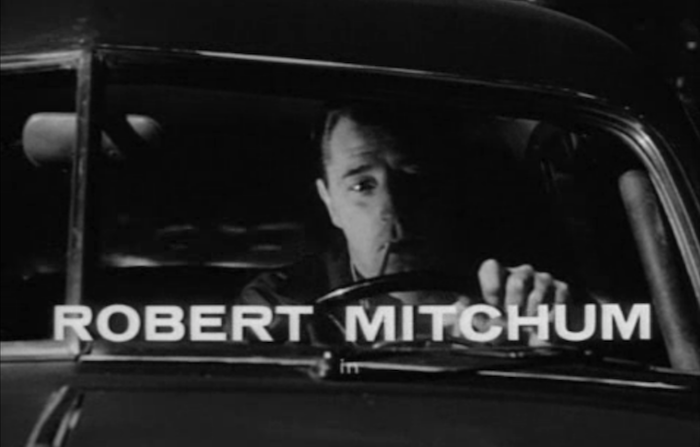 The focus here is on letting Mitchum act cool when there isn’t a car chase going on — and it completely succeeds. The making of Thunder Road has become legendary. 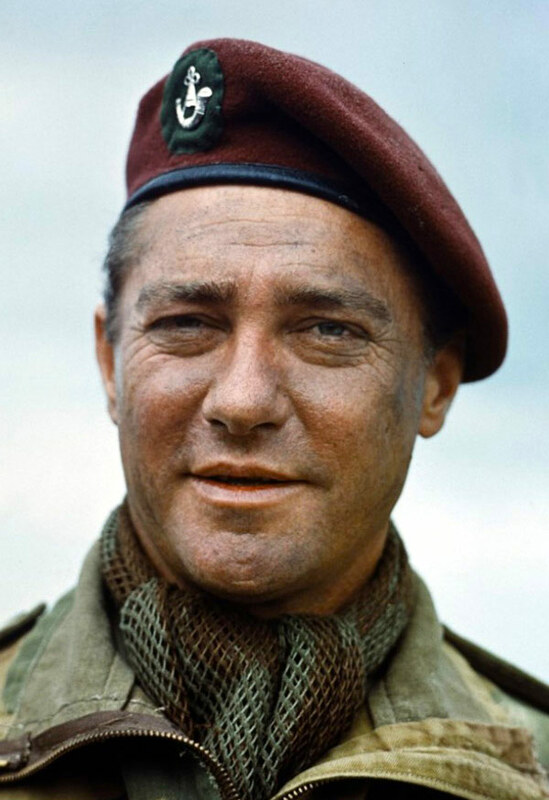 Mitchum evidently split his time between the moonshiners and the female population of Asheville, North Carolina — and somehow showed up on the set each morning ready to go. Just a little makeup to cover the dark circles under his eyes. 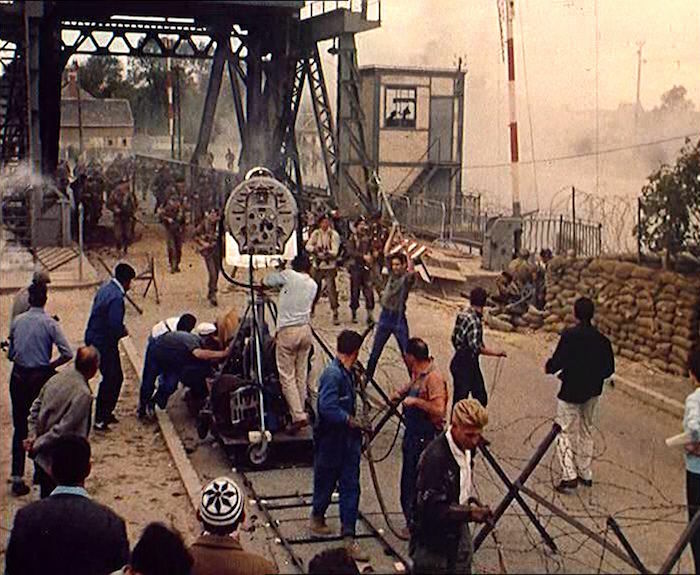 The cars used in the film were purchased from area “transporters,” and the stunt crew put those cars through their paces on the winding mountain roads around Asheville (including US 129). The transporters, in turn, used the money to buy newer, better, faster cars. A win-win situation, as they say. The Apple Festival parade, Hendersonville, North Carolina. 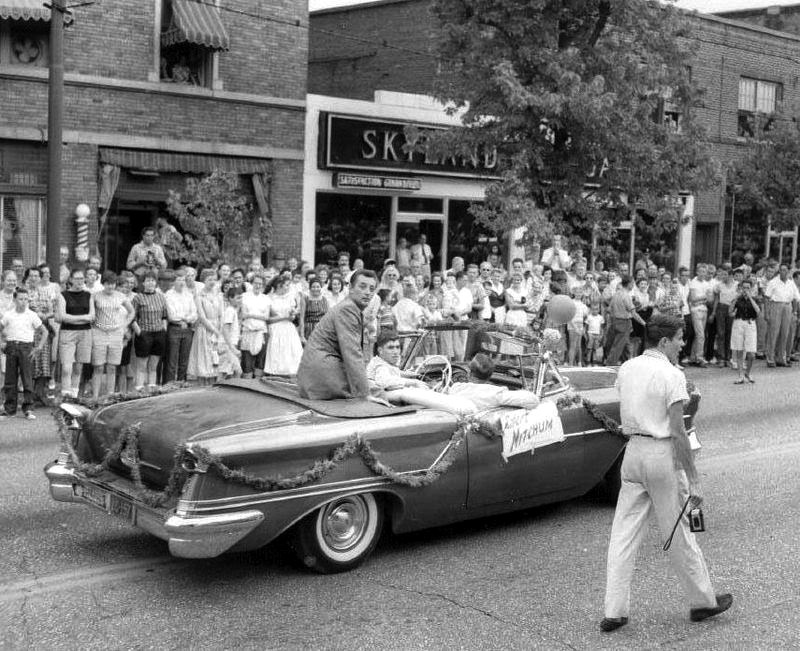 Quite a bit of the local citizenry found themselves in minor roles, while Mitchum ended up the Grand Marshal of Hendersonville’s Apple Festival Parade (above). Some of the Asheville buildings you see in the film are still around. Then there’s the Elvis connection. 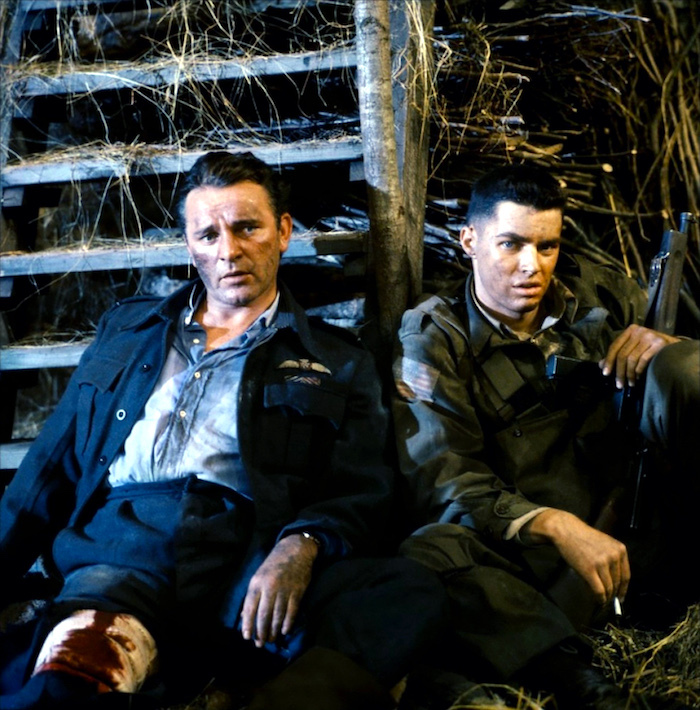 Mitchum and Elvis Presley talked about Elvis playing Lucas’ brother Robin. But Elvis’ manager Colonel Tom Parker demanded a salary that approached what was budgeted for the entire picture. 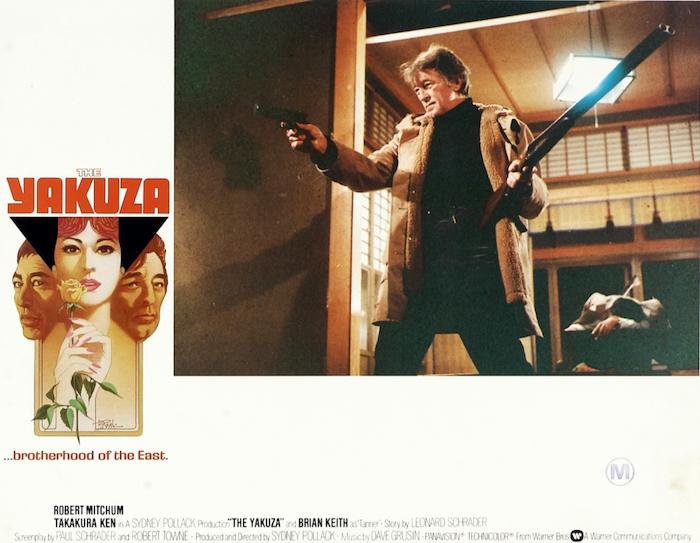 Jim Mitchum, Robert’s son, was cast instead. Nothing against Jim, but Robert Mitchum and Elvis in a movie about running liquor in 1950s Fords (’50, ’51, ’57) would have easily been the Coolest Movie Of All Time. That’s not to say that what we have isn’t plenty cool enough. 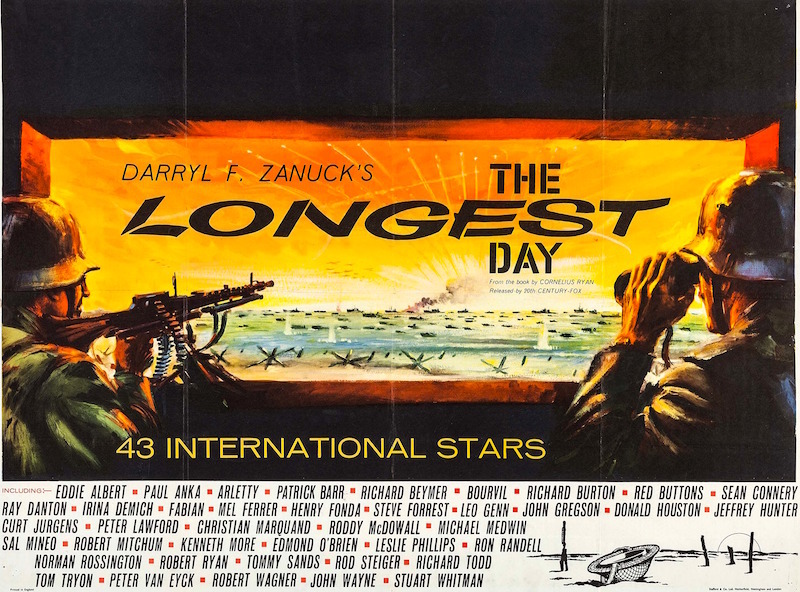 It’s a fast-paced, gritty little thing with a good performance from Mitchum and a really good one from Trevor Bardette as Lucas’ bootlegging daddy. Gene Barry’s part is a bit generic, and it’s really obvious how inexperienced Keely Smith was. 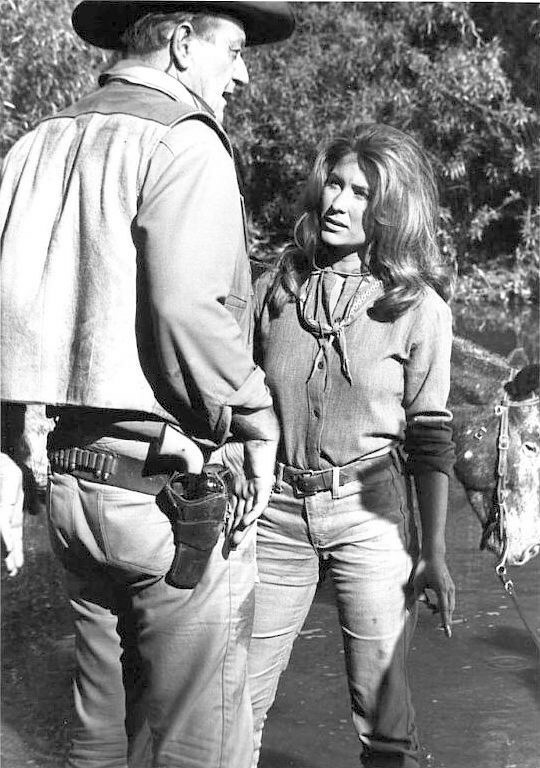 There’s a really odd feel to her scenes with Mitchum. The Asheville locals, as you’d expect, turn in some shaky performances here and there, but they sure look authentic, as does about everything in Thunder Road. Real people, real cars, real roads — this authenticity gives the picture a huge boost and might explain why Southerners took to it like they did. The South rarely comes across this real in movies. Jack Marshall’s music is another standout. His supercharged jazz-country score fits Mitchum’s film like a glove. He was a perfect choice; he got it. 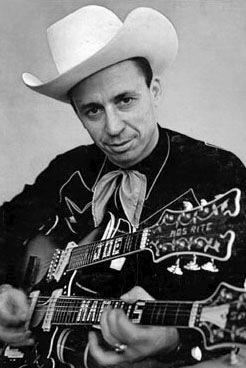 The blistering guitar licks are the work of the great Joe Maphis, “King Of The Strings.” (If you want to be absolutely amazed, look up Joe on YouTube and watch his fingers fly!) Jack Marshall scored a few late-50s exploitation flicks (like The Giant Gila Monster) and lots of TV, with his supreme contribution to popular culture being the theme to The Munsters. The revered Bear Family label has recently released the Thunder Road score on CD. Play it in your car, and you can count on a speeding ticket. Of course, the reason for this post is that Shout Factory has blessed us all with Thunder Road on Blu-ray (there’s a DVD in there for good measure). It’s exactly the kind of presentation I like — it looks like a movie. There’s all the grain and texture we expect — with this movie having a bit more than usual (which is a good thing). 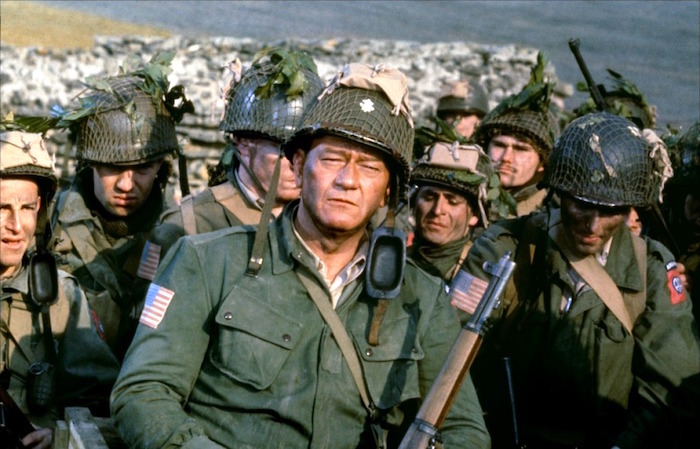 It’s real close to the original 1.85 framing, and that alone is reason to ditch the old MGM DVD in favor of this one. The sound’s crisp and clear — it’s hard to decide what’s more beautiful: Joe Maphis’ guitar or those souped-up Fords. This is a good time to be digging into low-budget movies of the 50s — from Thunder Road to The Quiet Gun to It! The Terror From Beyond Space, with them showing up on Blu-ray looking like this from folks like Shout Factory, Kino Lorber and Olive Films. 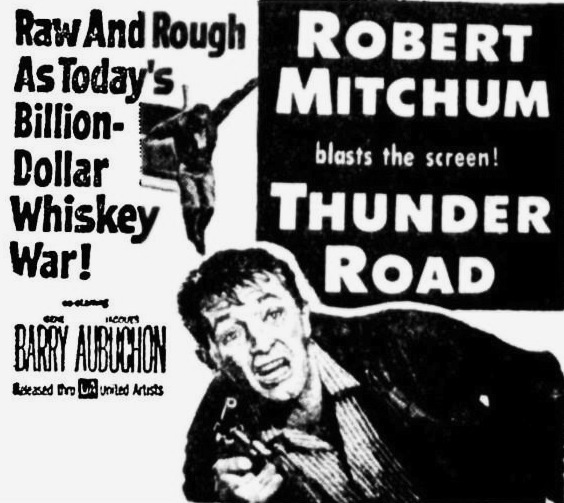 So raise a Mason Jar of the finest white lightning to Shout Factory for giving us a premium edition of Mitchum’s high-octane, high-proof, low-brow masterpiece. Highly recommended. Blu-ray News #18: Thunder Road (1958). 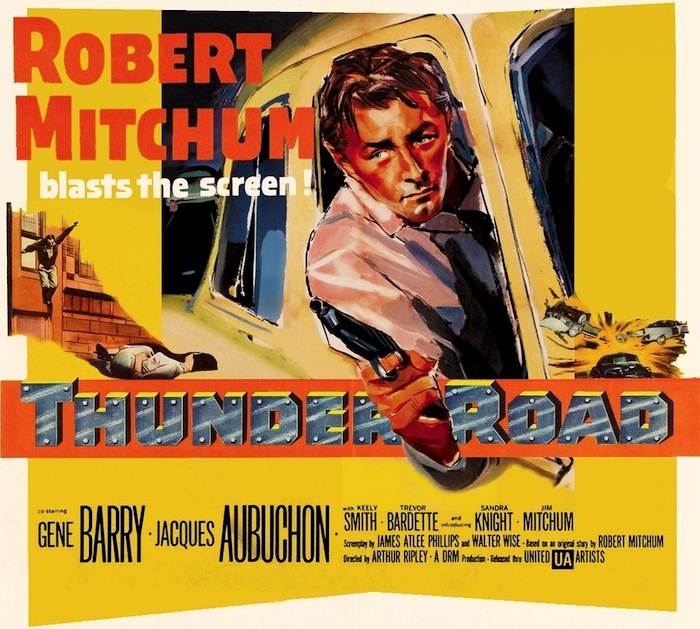 Here in North Carolina, Thunder Road (1958) — Robert Mitchum’s tale of runnin’ moonshine, is part of our heritage. Filmed around Asheville, it was a staple at small town drive-ins for decades. 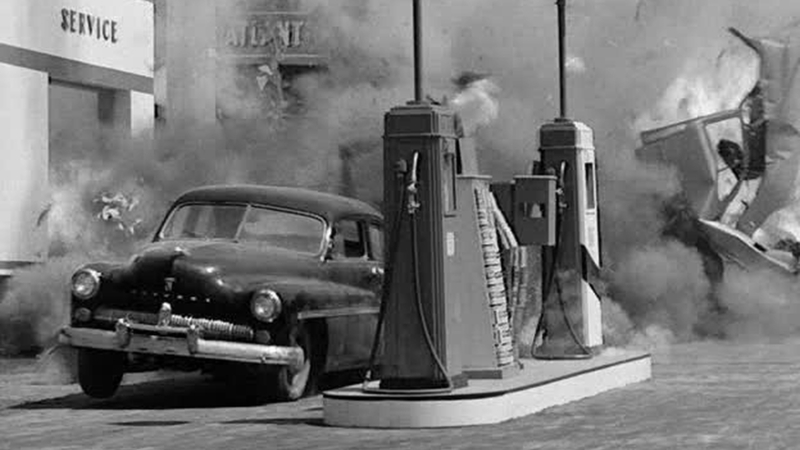 For the rest of the world, it’s a tough little indie movie with Mitchum driving a 1950 Mercury full of hootch like a bat outta hell, with Gene Barry as a federal man hot on his trail. And now it’s on its way to Blu-ray in April. I’m glad it’s in the capable hands of the folks at Shout Factory, who I’m sure will treat it like a fine batch of sippin’ whiskey. The old full-frame DVD always drove me nuts. And dig this: Bear Family has the soundtrack.